My 30th birthday gift ideas for men reflect what this time means in his life. 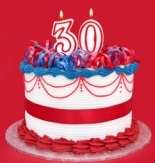 I found this great quotation about what it means to be 30. So with those thoughts in mind, here are my ideas for 30th birthday gifts for men. Hiking shoes - choose a quality brand like Merrell or Columbia . If he's got a summer birthday, choose things for working out in the summer. If his birthday is in the winter, choose things for working out in the winter. A balaclava will keep him warm, and he'll look like a ninja! You may not want to pick out clothes for him. I understand. Here are some ideas for accessories that can help him look good at the office. A nice watch. Watch prices range from a few dollars to more than $10,000. Quality brands that usually offer affordable choices include Invicta , Skagen , and Seiko . For the step above these, choose brands like Bulova , ESQ , Tissot , and TAG Heuer . If he carries things back and forth to work, a briefcase could make a great gift. Of course, a mens wallet is always a nice gift. I'd stay way from buying socks, dress shoes, or pants for a man, because style and fit can vary so much. You're pretty safe with buying a watch, briefcase or wallet. Cooking food on a grill is such a manly thing. I love to grill burgers and hot dogs, steaks, chicken, pork chops, and even veggies. If he doesn't already have a grill, get one! That would make a great 30th birthday present. If his birthday is in the summer or fall, get one from your local Lowe's or Home Depot. You can get some good deals if you buy at the end of the season, but the selection is not as good. Regardless of whether he has a charcoal or gas grill, here are some great accessories to make the grilling experience more pleasant. They are great 30th birthday gift ideas. Grill tools like tongs and spatulas. Grill covers to protect your grill from the elements. Grill cleaning tools to make cleanup easy. BBQ platters for serving the freshly grilled food. I hope he enjoys his gift. Tell him I said "Happy Birthday"!